February, 2019 — Two papers published! Head over to the publications tab to see two new papers hot off the press. Recently graduated PhD student Omid Haji Maghsoudi has published another chapter of his thesis on tracking several landmarks on running rodents (article in press; the DOI may not work for a few days -- but it will be here: 3D Based Landmark Tracker Employing a Superpixels Method for Neuroscience, Biomechanics, and Biology Studies.). Second is some really fun work I did back at the RVC helping then PhD student Zoe Self and Alan Wilson gather some truly novel data - force data from ridden galloping horses! See the Biology Letters paper - interestingly, horses have closer to a 50:50 impulse distribution when galloping, not the expected ratio of 60:40. Could they be running up against a force limit, and so they must evenly distribute the load? Find it here: External Mechanical Work in the Galloping Race Horse. January, 2019 — Dr. Omid Haji Maghsoudi off to postdoc at Univ. of Pennsylvania! After defending in November, former PhD student and now Dr. Omid Maghsoudi is heading to Penn to round out his training with a postdoc in using breast cancer diagnosis using computer vision, Deep Learning, and new imaging modalities. He'll be working with Prof. Despina Kontos, doing really cool work to understand how best to predict breast cancer risk. Neat, important work! November 26th, 2018 — PhD Student Omid Haji-Maghsoudi successfully defends! Omid Maghsoudi did an amazing job defending his PhD thesis work on Monday November 26th. Basically zero corrections and now he's Dr. Omid! Again I have been so fortunate to have such a smart, hard working student during the founding years of my lab at Temple. Omid has a number of publications with several more coming, please see our lab publications page. October, 2018 — Book review published! October, 2018 — Congrats Michelle Reeve! An amazing former PhD student Michelle Reeve, who started with me at the RVC and then moved over to work with Monica Daley when the lab moved to Temple, has finished her PhD on spider gaits. Congratulations Michelle, all the best and enjoy being a Dr.! October, 2018 — Good luck Tommy Hallowell! We're losing former BIOE Masters student and our lab Neurotechnician Tommy Hallowell to CHOP - a bummer for us, but excited for Tommy and wishing him all the best. I'm sure we'll see him around - not least at his goodbye party at Urban Axes. September, 2018 — Fun visit to Georgia Tech! I gave back to back invited talks in Physics and Applied Physiology/Biology at George Tech on September 18th and 19th. Was great to catch up with excellent hosts Greg Sawicki and Simon Sponberg. Their groups are up to amazing things - I highly recommend checking out the work done in Simon's Agile Systems Lab, and Greg's Human PoWeR lab. Tim Cope, Young-hui Chang, and Richard Nichols are likewise doing exceptional things to understand feedback pathways in mammals. Thanks again! August, 2018 — Omid passes PhD thesis proposal! Phd student Omid Haji Maghsoudi did a stellar job in his PhD thesis proposal on August 27th, passing with flying colors. With 3+ papers published, it was bound to go smoothly. Great job on your presentation Omid! July, 2018 — Several papers published! We have a bolus of work coming out now - please check out our Publications page. PhD student Annie V has her work on mouse gait control structure investigated through "earthquake" perturbations in the Journal of Biomechanics, PhD student Omid M has a nice Matlab electrode impedance characterization software package and some new tools for automatic tracking of rodents from video, and in a longstanding collaboration with Tonia Hsieh from Temple Biology and postdocs Simon Wilshin and Paul Shamble we have a neat JEB paper on spider gait adaptation after limb autotomy. Phew! Kathryn Knight has done a very nice piece on the spider ablated gait work for Inside JEB, here. June, 2018 — New grant awarded! The Spence group has been awarded three years funding from the Craig H. Neilsen Foundation called Can chemogenetic afferent stimulation enhance recovery from SCI?. We're very fortunate to have the support of another exceptional foundation. Related but distinct from our Shriners work, in this grant we're dissecting which afferent pathways are critical to providing the enhanced recovery from spinal cord injury that we see with epidural electrical stimulation (EES), in humans and rodents. We'll be using DREADDs and transgenic rats to tease apart the sufficiency of subsets of afferents. After defending in April, former PhD student and now Dr. Annie Vahedipour is heading to Yale to round out her training with a postdoc in Parkinsons research. She'll be working with Prof. Nigel Bamford, doing really cool work using optogenetics to understand mechanisms of the disease in mice, and making use of her locomotor behavioral and mouse surgical skills to better quantify the phenotype of the disease. 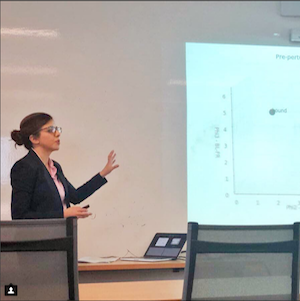 April, 2018 — PhD Student Annie Vahedipour successfully defends! Annie Vahedipour did an amazing job defending her PhD thesis work on Friday April 20th. Minor corrections are done and now she's Dr. Annie! Honestly I am so lucky to have had such a passionate, tenacious student! Her first chapter is under review at J. Biomech - "Uncovering the mouse gait controller using mechanical perturbations," with two more to follow. November, 2017 — Postdoc position available! With the new grant mentioned below, we have a 3 year opening for a Postdoctorate Fellow, to look at using chemogenetic tools (DREADDs) selectively modulate reflexes in moving rats, to aid in recovery from spinal cord injury, and uncover mechanisms of motor control. Funded by the Shriner's Hospitals for Children, please find a flyer here. November, 2017 — Grant awarded! The Spence group has been awarded three years funding from the Shriner's Hospitals for Children called Chemogenetic afferent modulation to improve recovery from SCI! We're very excited to have the support of this wonderful foundation, and are looking forward to some exciting new work in aid of those living with spinal cord injuries. June, 2017 — Paper published on role of symmetries in gaits and gait transitions! We have another new paper published on our gait work: studying the ability of mathematical symmetry considerations to predict the dynamics of quadrupedal gaits and gait transitions. Extends the work of Golubituksy and Schoner, and in collaboration with our friends Daniel Koditschek at Penn and Shai Revzen at Michigan. The paper is here. March, 2017 — Paper on dog gaits on rough terrain published! We have new paper published on our gait work: studying how dogs move on rough terrain - it is inspiring new robot controllers, and will helps crack spinal cord circuits. Our collaborator Shai Revzen at Univ. Of Michigan has a great blurb on the work here. The paper is here. March, 2017 — PhD student Annie Vahedipour-Tabrizi successfully completes her dissertation proposal! Annie did a great job and is now advances to PhD candidacy. Congrats Annie! March, 2017 — Undergrad Haley Smith off to BackyardBrains paid summer internship! BackyardBrains is a super hip company that makes amazing neuroscience kits for everyone. Mosquito love song project? A pretty cool way to launch an engineering career. Haley built and used the BackyardBrains SpikerBox and EMG SpikerShields in my Neuroengineering and Biomechanics lab classes, and analyzed real neural data from cockroach legs in Matlab. Congrats Haley! February, 2017 — Undergrad Lubaina Shakir off to Columbia for Masters in BME! Lubaina is working hard on using new genetic techniques to treat spinal cord injury. Congrats and enjoy NY! February, 2017 — Undergrad Matt Short off to prestigious NIH Besip internship! Matt has worked incredibly hard in the lab on implantable neural and optical nerve cuffs for motor control and rehabilitation, taking us towards applying optogenetics to these areas. NIH BESIP program. June, 2016 — Two papers published! BANCOM is Biomechanics and Neural Control of Movement. - the resurrection of a 1996 conference that was a seminal meeting. A great diverse crowd of figures from across several fields. Ben Robertson and Prof. Spence gave poster presentations, where utilization of genetic tools was recognized as an important emerging frontier, noted by Zev Ryman (RIC) and Richard Carson (Trinity College Dublin). Gal Haspel and NJIT hosted a great Frontiers in Applied and Computational Mathematics conference. Prof. Spence gave a talk on our quadrupedal gait modeling work. Brooke Flammang hosted a great North Atlantic regional SICB (Society for Integrative and Comparative Biology) meeting at NJIT. Postdoc Ben Robertson, PhD student Omid Maghsoudi, and undergraduate Lindsey Yam gave presentations. PhD student Omid Maghsoudi is presenting his computer vision work to automatically track the paws and body of mice from high speed video at our locally hosted IEEE Signal Processing in Medicine and Biology conference. October, 2015 — Presentations at SFN (Society for Neuroscience), Chicago! PhD student Annie Vahedipour-Tabrizi, postdoc Ornella Capellari from the Royal Veterinary College, and Prof. Spence gave presentations at SFN 2015. Lots good feedback on our work, and exciting work going on in genetic dissection of spinal networks by the Kiehn lab and David Magnusen's labs, and other working to identify transcription factors in different classes of sensory afferent. Prof. Spence and postdoc Ben Robertson gave invited talks at the "Adaptive Motion of Animals and Machines Conference, hosted by MIT". Hosted by the awesome Sangbae Kim, we got to see a demo of MIT's Atlas robot, which was entered in the DARPA Robotics Challenge. Prof. Spence also presented work in two workshops at the Robotics: Science and Systems conference in Rome. A cool meeting where Deep Learning was a hot topic of debate. June, 2015 — PhD students win summer awards! PhD students Annie Vahedipour and Omid Maghsoudi win First Summer Research Initiative awards from the graduate school. January, 2015 — Paper published! Bolder stickleback fish make faster decisions, but are not less accurate.Mamuneas, Diamanto, Spence, Andrew, Manica, Andrea, King, Andrew. Behavioural Ecology (2015) 26 (1): 91-96. January 2015 Issue. Postdoc Simon Wilshin will be presenting our work to develop more stable controllers for legged robots based on observations of dogs walking on rough terrain at the Society for Integrative and Comparative Biology 2015. Trips to visit Noah Cowan and Tom Roberts, and give seminars in Mechanical Engineering at Hopkins and EEB at Brown. Folks there are doing very cool things in control as it applies to animals and robots (Cowan), and in muscle and evolutionary biomechanics at Brown. September, 2014 — Ben Robertson joins the lab as a Postdoc. Ben Robertson, fresh off his PhD with Greg Sawicki at the Human PoWeR lab at NC State / UNC Chapel Hill, has joined the lab. He's going to be working on applying neurogenetic techniques to questions in locomotion and neuromuscular physiology. The Philadelphia Inquirer has a nice piece "Illuminating Technology" on optogenetics, including our work here at the Spence Lab. Annie Vahedipour-Tabrizi, a PhD student in Temple Bioengineering, has joined the Spence group. She'll be focusing on developing the biomedical and molecular genetic technologies we need to do optogenetics in vitro and in vivo in mice. Welcome Annie! February 17th, 2014 — PhD Studentship awarded! A very fun PhD studentship that the Spence group is part of has been awarded by Microsoft Research -- a collaborative, interdisciplinary effort to develop general methods for tracking, and generalising, the shape and motion of quadrupeds, using video and Kinect 2.0 technologies. The project is Understanding the moving quadruped: computer vision to advance science, medicine, and veterinary care. The proposal is a neat collaboration between computer vision gurus Gabe Brostow (UCL), Jamie Shotton (Microsoft Research), bioengineer and clinical technologist Thilo Pfau (RVC), and myself. The (ambitious) plan is to push back both computer vision and biomechanics... developing new techniques in vision that can learn to track generalized moving legged systems; and use this to gather a large comparative data set across a range of species of quadruped, with which we can test quite general hypotheses of how body shape combines with energetic and safety constraints to produce locomotor behaviour. Phew! Interested applicants for the PhD please contact Gabe Brostow. February 12th, 2014 — New grant awarded! The Spence group has been awarded three years funding from the Army Research Office for NOFALL: Neuromchanics and Optogenetics: Dissecting Fast Legged Locomotion! We're very excited to have ARO support, and are looking forward to some exciting new experiments and technological devleopment. January 1st, 2014 — Recruiting PhD students and Postdocs! The Spence group has funding and openings for PhD students and postdocs. Please send Andrew Spence email (aspence at temple.edu) for further information. November 1st, 2013 — The Spence Group has moved! The Spence group has moved to the brand new Department of Bioengineering at Temple University in Philadelphia, PA. This is a really exciting move -- the Department is starting with a blank slate, and Temple has some exciting new folks to collaborate with across campus, in the Hsieh Lab and in John Jeka's group. But it is also very sad to be leaving the extraordinary Structure & Motion Laboratory; such a dynamic place with so many wonderful people. Luckily we have plenty of excuses to visit! September 9th, 2013 — British Science Festival Robot Demonstration! PhD student Michelle Reeve and I demonstrated our XRL RHex robot at the British Science Festival 2013 in Newcastle. Interested local school students enjoyed the demo, asking some pretty sharp questions "so how does an octopus locomote, anyways?" and generally getting a hands-on look at a dynamic legged robot clambering around campus and up stairs. August 16th, 2013 — Paper recommended by the Faculty of 1000! Our article Insects Running on Elastic Surfaces has been nominated for the faculty of 1000. July 16th, 2013 — Paper published! Fast horses, robots, and neurotechnologies: Discovering how to go fast on legs. Science in Parliament (2013) 70 (3): 23–25. Summer 2013 Issue. A new big picture paper, based on the talk below, discussing the exciting frontier of discovering how animals move. Well received by MPs and industry alike at the Science in Parliament Committees seminar on Speed. April 3rd, 2013 — Paper published! A.J. Spence, G. Nicholson-Thomas, R. Lampe. Closing the loop in legged neuromechanics: an open-source computer vision controlled treadmill. Journal of Neuroscience Methods (2013), in press. New paper showcasing our new feedback controlled treadmill system. Opens the door to many exciting new experiments. I'm going to be giving a talk on this Wednesday the 13th for an exciting Research Seminar Series at the Centre for Sports Medicine and Human Performance at Brunel University in London. Should be exciting -- the session is Frontiers in Sport and Exercise Science and Medicine, and has some interesting talks on physiology and performance. Talks run from 9:30 in the Heinz Wolff Building, Brunel Uxbridge Campus. February 25th, 2013 — Visit to the Kod*Lab and Hsieh labs! An exciting day giving a seminar for the Kod*Lab research group meeting, and catching up with Prof. Koditschek and our friends and collaborators in his group, Aaron Johnson, Avik De, Justin Starr, and others. They are doing some amazing and varied work in robotics and mathematics -- and definitely not "plain vanilla engineering" -- they are pushing in all sorts of fascinating directions, including tumbling robots! Kod*Lab at Penn. Then had an all too brief catch up with Prof. Tonia Hsieh at Temple, who is doing really cool stuff with Lizards on slippery surfaces and is part of our ongoing collaboration looking at how spiders that are missing legs adapt their gait and leg function. Welcome to Dr. Ornella Capellari who joins the Wells and Spence groups as part our BBSRC Neuromechanics and Optogenetics grant. Ornella joins us from UCL, where she did some beautiful work with Giulio Cossu. Welcome Ornella! The November 18th issue of The Daily Telegraph's Seven Magazine featured a piece on research that aims to make horse racing safer. They interviewed Alan Wilson and myself about my postdoctorate work with Alan characterising different racing surfaces, and how they impact the horse. An interesting piece, we're beginning to gather large enough data sets to really determine what mechanical effects are causing injury -- and to systematically characterise surfaces. November 5th, 2012 — Tenure!!! October 24th, 2012 — New BBSRC Grant Awarded! The Spence group has been awarded a large BBSRC grant for a 3-year project entitled “Foundations of Neuromechanical Systems Biology.” With co-investigators Prof. John Hutchinson and Prof. Dominic Wells, this project will use a technique from the frontier of molecular genetics, optogenetics, to tease apart the contributions of the nervous and mechanical systems to fast legged locomotion. June 12th, 2012 — Paper published! PhD student Zoe Self has published her work on maximum performance in race horses, looking at how their performance is affected by incline and decline locomotion. May 28th, 2012 — Undergraduate Michelle Reeve wins PhD studentship! Undergraduate student Michelle Reeve, who has done both her 2nd and 3rd year research projects with us, as well as taking the Comparative Animal Locomotion course, has won a place on a very competitive PhD studentship! Called the London Interdisciplinary Biosciences PhD Consortium, the studentship is hosted by several top London universities, including the RVC and University College London, and includes a full year of background work in mathematics and systems approaches in biology. Well done Michelle! May 8th, 2012 — Paper published! Prof. John Hutchinson and I have written an interesting big picture editorial on size in biology, for a special issue on size in Current Biology — we run the gamut from molecules to whole animals. It was pretty cool to look at how size is controlled across a huge range of sizes: paper here. March 7th, 2012 — Paper published! Prof. Alan Wilson and I have had an exciting and long standing collaboration looking at a huge data set of radio tracking data from horses during horse racing — and we've made the exciting finding that aerodynamic drafting is extremely beneficial. This adds horse racing to the list of sports where this effect is important (cycling, human running, swimming). Paper here.